Tired of your baby getting woken up When you have a napping infant, you'll often do anything to keep them asleep. 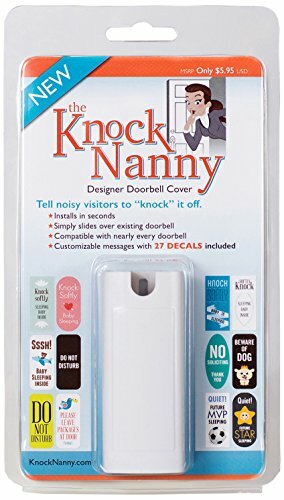 The Knock Nanny eliminates noisy visitors from the equation. By simply sliding the Knock Nanny cover over your existing doorbell, you can tell noisy visitors to "knock" it off. This stylish doorbell cover includes 27 professionally designed decals. These decals include messages such as "Knock Softly- Baby Sleeping", "No Soliciting", "Do Not Disturb", "Please Leave Packages at Door", and others. The Knock Nanny easily installs in seconds on virtually every type of doorbell. No more obtrusive signs or deteriorated hand-made notes taped to your home. What mom and baby really need, is their sleep. Visit www.knocknanny.com for more information.